“The most exhilarating storytelling on Broadway in decades” (New York Times) makes its central Virginia regional debut at the Academy of Fine Arts, in partnership with Liberty University and the Alluvion Stage Company! Winner of five Tony Awards, this swashbuckling prequel to Peter Pan-based on the novel co-written by Dave Barry-uses a dozen actors playing more than a hundred unforgettable characters, all on a journey to answer the century-old question: How did Peter Pan become The Boy Who Never Grew Up? “Fantastical and enchanting” (Philadelphia Inquirer), “absurdly funny” (Entertainment Weekly) and suitable for younger audiences over 10. 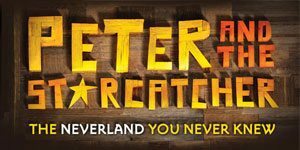 Come take a hilarious romp through the Neverland you never knew! Jan. 15, 16, 17, 18, 20 – 7:30 p.m.
Jan. 22, 23, 24 – 7:30 p.m.
Jan. 17, 24 – 2:00 p.m.
Jan. 18, 25 – 3:00 p.m.
Tickets sold through Alluvion Stage Co. Click below to redirect, or call 434-582-2078.